StubHub enjoyed its best ever day of sales at this year’s Super Bowl. 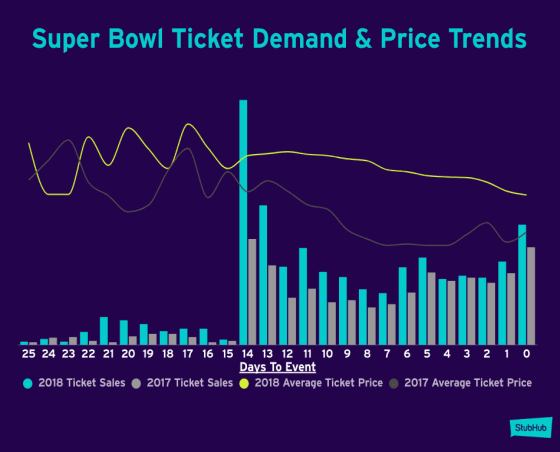 The resale site sold 34 per cent more tickets on Super Bowl day compared to the 2017 event. The February 4 game saw the Philadelphia Eagles beat the reigning champions, the New England Patriots, to take home their first Super Bowl win in history. The average ticket sale price of $4,798 on StubHub was more than $500 dearer than any other Super Bowl. The average price on StubHub was around $800 higher than last year’s game. Sales coming from Pennsylvania represented 12 per cent of all Super Bowl LII ticket sales on StubHub. Sales from the Eagles’ hometown state represented 11 per cent, 22 per cent and 35 per cent more of total sales than those from Massachusetts, California, and Minnesota, respectively. StubHub reports that its platform saw ticket buyers from all 50 states and 24 different countries. Eleven ticket buyers who waited until the last minute were able to snag $500 tickets for the Upper Corner and Upper Sideline. These $500 tickets were $1,000 less than the least expensive ticket sold for last year’s game. Meanwhile, the half-time show performance by Justin Timberlake seemed to boost demand for his new studio album tour, according to StubHub. Ticket sales the day after the Super Bowl jumped 392 per cent compared to those from game day. The artist also boasts the position as the second top-selling artist this year to date after Elton John.